GN Solids Control is top brand manufacturer for solids control equipment & drilling waste management equipment. Each year, we produce large qty of shale shakers, shaker screens, centrifuges, cuttings dryer, pumps, agitators, mud tanks to support the local market needs and overseas market needs. 4 panel shale shaker for oil gas drilling mud system. This 4 panel shaker is with shaker screen same size as to Swaco Mongooe. The clients can buy the shaker screen from GN or from Swaco to fit on GNZS594 shakers. 3 panel shale shakers for oil gas drilling mud system / HDD mud system / water well drilling mud system / Geothermal drilling mud system etc, this is middle size shaker which can be applied in various industries. The shaker screen size is designed by GN, and the buyer can only buy from GN for replacement screesn. 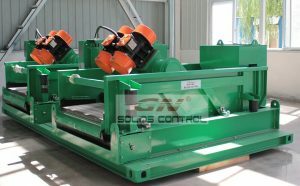 2 panel shale shaker is only can be used for some small rigs, like diamond drilling rigs, mining etc. In order to expand GN brand influence in the world, several years before, we start to provide replacement shaker screen for US brand shale shakers, which are much popular in every area of the world. Till to now, the stable working performance give much better and cost-effective shaker screens to client, and save lots of cost in drilling operations. More and more client shift to GN for replacement shaker screens, rather than to buy high price US brand shaker screen. 5) Replacement shaker screen for FSI 5000 shakers.